It’s one of the most conventional nuggets of political wisdom: To win an election, first secure your base, then expand from there. But it doesn’t always work out that way. 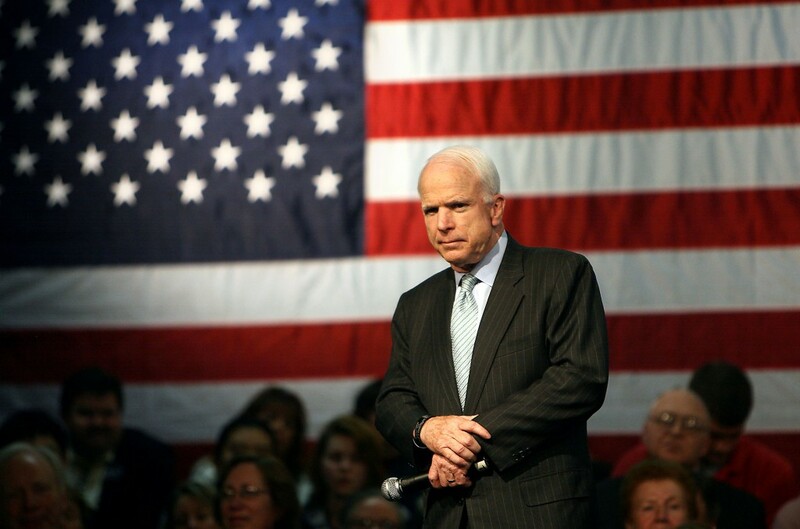 Take Republican Sen. John McCain in the 2008 New Hampshire primary. McCain ceded his party’s most favorable terrain – the populous southeastern slice of the state, packed with conservative voters – and claimed victory thanks to big margins in more liberal cities and towns. How did that happen? And what might it forecast about this year’s New Hampshire GOP primary? A good place to start is with the state’s fabled “independents.” These voters, unregistered with a political party, are the state’s largest electoral bloc — 45 percent of all voters. New Hampshire election laws allow independents to decide on primary day which party will get their vote. So every four years, campaign strategists, journalists and pundits scrutinize their every move. But tracking the precise impact of independents on any given race isn’t easy. Election returns don’t break down results by voter registration. And while exit polls indicate that McCain enjoyed strong support from independent voters in 2008, an analysis of actual results doesn’t reveal a relationship between the independent voter participation rate in a given town and that town’s vote outcome. For instance, in one of McCain’s best-performing towns,Hanover, and one of his worst,Salem, the share of Republican voters who came from the independent camp was identical: 36 percent. To be sure, results like this are muddied by the fact that there was a competitive Democratic contest that year as well. Independent voters flocked in much bigger numbers to that race, leaving a smaller share for Republicans. So, to better assess how independents shaped the GOP results that year, it helps to look at the returns in the southern counties of Rockingham and Hillsborough — the only two counties in which McCain and Romney were competitive. While the two candidates’ vote total was nearly equal in those counties, Romney was strongest in towns where independents were more likely than the state as a whole to take a Republican ballot. In other words, Romney won where the independents were more “Republican-leaning,” in keeping with his success in conservative regions statewide. He just wasn’t able to expand his support beyond that base. In 2016, by contrast, the fractured nature of the GOP field doesn’t line up as neatly as the McCain and Romney race. In addition, the current front-runner — Donald Trump — doesn’t conform to a conventional political ideology, and his campaign claims that it will attract voters who rarely show up on primary day. Perhaps the closest comparison to Trump might be Patrick Buchanan, the winner of the 1996 New Hampshire Republican primary. Like Trump, Buchanan ran on a populist, anti-establishment platform and attracted supporters eager to defy the wishes of Republican Party elders. Here’s what Buchanan’s 1996 New Hampshire victory looked like. It was a narrow win, with Buchanan grabbing 27 percent of the vote to edge out more mainstream candidates like Sens. Bob Dole and Lamar Alexander. But how Buchanan won is even more interesting, and could provide clues to Trump’s path to victory in the state this year. Buchanan cobbled together his victory with an odd geographic mix: strong margins in many of the most Republican leaning towns in southern New Hampshire, combined with support from a handful of working-class cities that typically vote Democrat in general elections — places like Berlin, Claremont, Rochester, and Manchester. 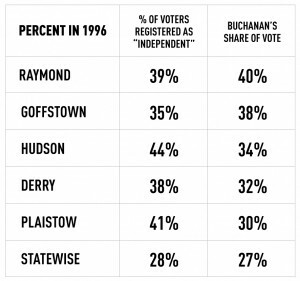 And many of the Republican-friendly places where Buchanan performed strongest were towns with a high share of independent voters (see table below). Put another way, Buchanan did best in places with lots of Republican-leaning voters who lacked strong ties to the Republican Party: i.e. conservative independents. Of course, this was 20 years ago, and New Hampshire has changed considerably since then, both demographically and politically. But a similar blueprint could work for Trump this year: big margins in rock-ribbed Republican areas with lots of independents, combined with support from the state’s old, working-class industrial centers. At the same time, a candidate this year could piece together a strong result – say, a clear second-place finish — using McCain’s very different ’08 strategy. That is, earn just enough votes in more left-leaning towns to edge out competitors battling in more conservative regions. Two contrasting approaches, each with a claim to victory. But in a year that’s already defied conventional analysis, an entirely new electoral map could emerge the day after New Hampshire voters have their say.